There were almost 650,000 total hip replacement procedures performed in Europe in 2017, with the majority completed using cementless implants. This total number, which includes replacements utilizing cemented, cementless, and hybrid cemented device options, is projected to increase at a CAGR of 2 percent and will surpass 730,000 by 2024. However, the movement toward cementless implants seems to be slowing as other technologies become more prevalent. Similar to the orthopedic market in the United States, cementless hip implants remain the most popular option for total hip replacement in the European region. However, the portion of the cementless hip market in the United States is considerably higher than in Europe. 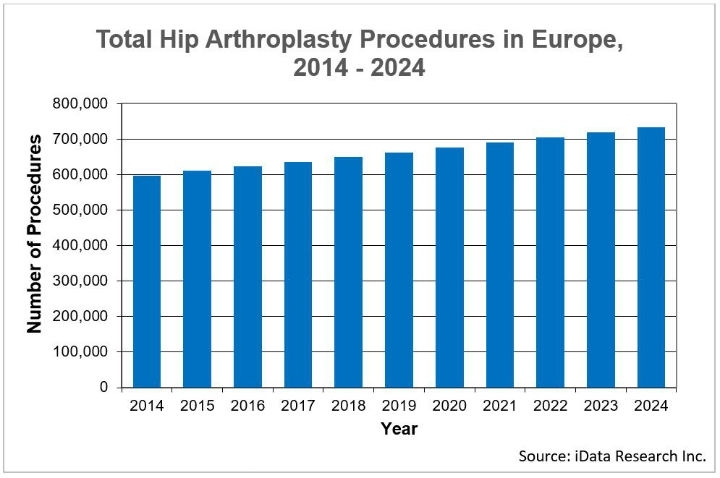 Moreover, while cementless hips will likely continue to cannibalize other cementation types in the United States, the European orthopedic community is expected to increasingly adopt hybrid implants that comprise both cemented and uncemented components. Between 2017 and 2024, hybrid hip implants are projected to exhibit the fastest growth in the total hip replacement market in Europe. Hip implants can be fixed to a patient’s existing bone with three fixation methods—with or without the use of bone cement, or as a combination of these two methods. Depending on the fixation type, total hip replacement implants can be divided into cemented, cementless, and hybrid devices. Orthopedic surgeons started to use cement in hip arthroplasty during the 1950s. 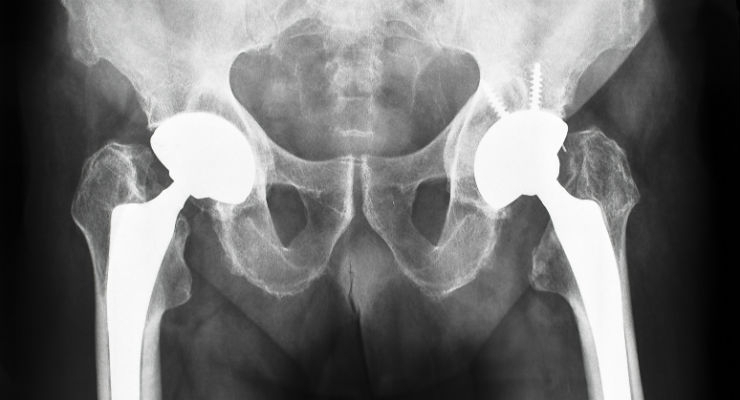 Since then, with the development of cementation techniques and materials, three generations of cemented hip devices have been used. The fourth generation of cemented hip prostheses feature a high-pressure lavage and canal plug and are considered to be the gold standard in cemented arthroplasty worldwide. With the introduction of cementless total hip implants in the 1980s, the cemented market has been gradually cannibalized by the cementless market. Cementless prosthesis components use biological fixation to ensure the implant holds to the patient’s bone. This is achieved by generating compression with the use of a slightly larger implant than the size of the bone-bed; therefore, cementless implants are also often referred to as “press-fit” devices. Hybrid devices combine different components—either a cemented stem with an uncemented cup or a cemented cup with an uncemented stem. The latter implant type is referred to as a reverse hybrid. The latest generation of cementless hip implants features the use of additive manufacturing technology. In recent years, some orthopedic companies have announced the limited launch of hip replacement products produced using 3D printing. For example, in March 2016, Smith & Nephew introduced their REDAPT Acetabular Fully Porous Cup with CONCELOC Technology in the United States. While some market experts believe the development and increasing adoption of additive manufacturing will likely accelerate the shift from cemented to cementless implant component options worldwide, other members of the orthopedic community remain skeptical about this technology. The current availability and use of such implants across the globe, particularly in Europe, is limited. The superiority of one fixation type over another has been argued by different experts in recent years, as different implant options are associated with a number of advantages and drawbacks. While all fixation methods, including cemented, cementless, and hybrid have been successfully used in hip arthroplasty over the years, their usage trends differ across the globe. More on the orthopedic large joints replacement market in Europe can be found in a series of reports published by iData entitled the Europe Market Report Suite for Orthopedic Large Joint Devices. This report covers the following market segments: hip implants, knee implants, and bone cement. The iData series on the market for orthopedic large joint devices covers the U.S., India, Japan, China, and 15 countries in Europe including Germany, France, the United Kingdom (U.K.), Italy, Spain, Benelux (Belgium, Netherlands and Luxemburg), Scandinavia (Finland, Denmark, Sweden and Norway), Portugal, Austria and Switzerland. Reports provide a comprehensive analysis including units sold, procedure numbers, market value, forecasts, as well as detailed competitive market shares and analysis of major players’ success strategies in each market and segment. To find out more about orthopedics large joint replacement market data or procedure data, register online or email us at [email protected] for an Europe Market Report Suite for Orthopedic Large Joint Devices brochure and synopsis.